After high school in the French part of Switzerland (bachelors degree) and law school at the University of Berne, I graduated in 1974. I was admitted to the bar in 1979 after one year of practical law training and working in the private industry. Between 1977 and 1982 I was a member of the management of our family enterprise, and have been Vice Chairman of the Board of Directors since 1977. 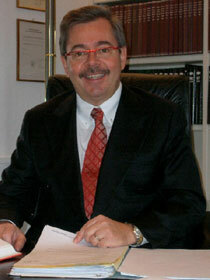 Between 1980 and 1992, I was also member of the Board of Directors of a bank in Switzerland. In 1982 I spent 1 year in California, USA with a six-month practical course in a law firm in Pacific Grove/Monterey. I have been working in my own law office as an Attorney at Law and Notary Public since 1983. In addition, I was the Secretary General of a scientific professional association.